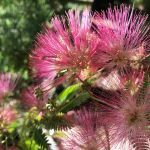 I am in love with edibles, I especially love subtropical fruits, and I have been very lucky to find an amazing resource almost right in my own backyard! As a matter of fact this nursery actually is someone’s backyard. I have been trying (in vain) to grow a fruiting banana but the weather here in the Santa Clarita Valley has been conspiring against me. I’ve killed two already (yes, I have a kill list where they are prominently displayed) and I will try again because given the right circumstances I will grow my own bananas! In the meantime after negotiating with my friend Alex (who you will meet below) I was allowed to buy a somewhat rare (and not at all cold tolerant) banana called a Misi Luki. Which I promised to plant at my best friend’s house down in Huntington Beach, I am very proud to say that it has fruit on it! 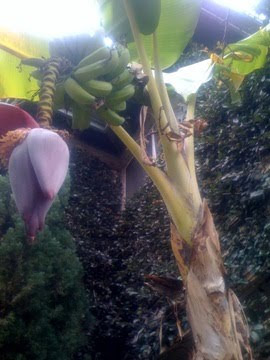 You can grow top quality bananas at home in most of Southern California (Sunset Magazine zones 18 – 24). It’s a matter of selecting the correct variety, providing the banana’s special fertilizer needs and performing a few thinning operations. Your reward will be beautiful, tropical foliage and annually about 40 lbs per bunch of unusual, vine ripened fruit. 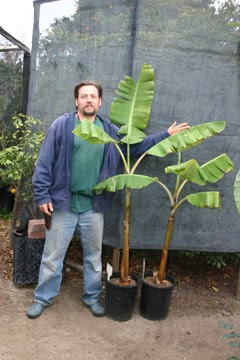 · Most banana plants fruit 18 months from first planting and every year thereafter. They are self-fruitful. Raja Puri, Cavendish, Dwarf Orinoco and Dwarf Jamaican Red. · Cold sensitive types include: Cavendish, Williams, Iholena, Lacatan, Dwarf Jamaican Red, Mysore, and Enano gigante. 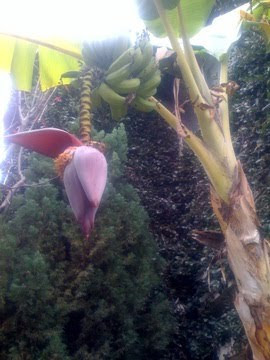 · Bananas are free of pest and disease problems in California. · Bananas are decorative and distinctive; they require only 4 square meters of growing area and thrive when planted next to south facing buildings (their roots are noninvasive). · Locate in full sun; choose a wind-protected site. · Incorporate an abundance of planting mix or compost. · Water weekly; they are shallow rooted and benefit from a deep (3”-6”) layer of organic mulch. · Use chicken manure plus a source of potash such as Sul-Po-Mag (K-Mag) or sulfate of potash. Or apply 6 lbs. Per year of (10-5-40 or similar) using three split applications. · During the first season cut out all “pups”. Thereafter, each year leave the first two pups appearing in spring; and remove all others. · Cover the fruit with a large light blue plastic bag open at the bottom. · Cut off the flower bud when emerging fruit stop hanging on while leaving approximately a 6” long stub at the base. · After the harvest, cut the stalk off at ground level. A machete works well for this. You can also use a spade to cut the base at ground level. Remember to peel away any dry tissue to facilitate the use of the spade. · Prop the heavy bunches with two poles, or tie it to an adjacent building.